Walter Page was born in Gallatin, Missouri in the dead of winter, February 9th 1900, he was introduced into the music scene early and began with instruments such as the tuba and the brass drum. He would play with bands in his neighborhood. He attended Lincoln high school in 1914 it was the only all black high school in the city. Walter’s time in high school was separated between playing in local clubs and learning from his professor, Major M. Clark Smith. 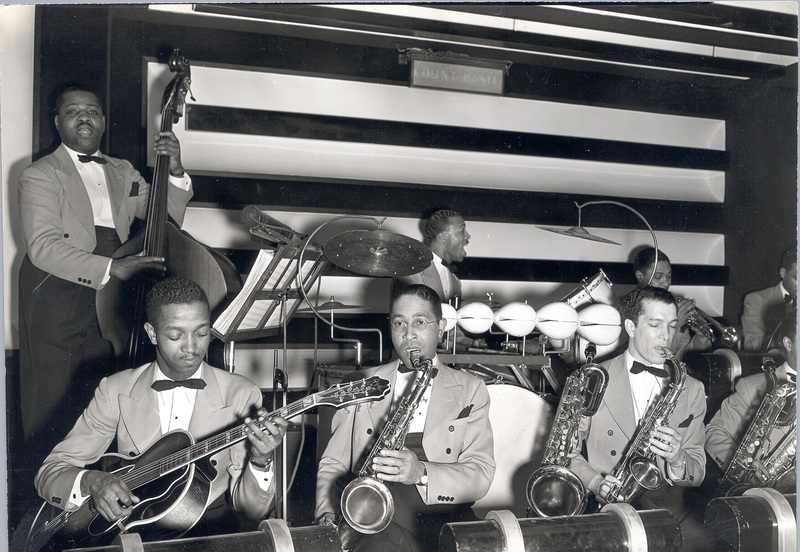 Smith was a former military band leader, and Walter’s start of formal music training “he taught almost everybody in Kansas City”.1 Walter was also inspired by Wellman Braud, who he saw play from the front row in high school. Walter’s teenage home was a few blocks from the high school at 2533 woodland. His mother, who owned her own business by 1917, as a hairdresser, would play folk songs for him as a boy, adding to his interest in music. After high school, in 1918, he spent time playing with Bennie Moten’s Band, as well as studying gas engines until he went to college in 1921. He went to Kansas University a few years after high school, starting in the fall of 1921. He had troubles in college even though he was in the fraternity Alpha Phi Alpha. The Klu Klux Klan was a present force at the college during these times and would attend all of the athletic games. Walter was only one of sixty African American students out of the 4,000 total student body. He also was not allowed to participate in any of the dances held by the school or perform the music he was learning. Despite all of his setbacks he attended the school of fine arts to learn to become a music teacher as well as studied gas engines. He finish his three year music courses in a year, but could not stand to be in be there any longer. He left college in 1923, however he spent time with Bennie Moten’s band between high school and finishing college. Bennie would pay for Walter’s food and transportation as he traveled from show to show. During the summer he would work with union pacific and they would travel, he wanted to go to California but never got the opportunity due to school. After college he toured with T.O.B.A. a string of 80 theaters between Philadelphia and Texas before finally settling down in Oklahoma City in 1925. Before his settling down he joined the Blue Devils Kansas City in 1922, taking major musicians from the Territorial bands, such as “Hot Lips” Page, Jimmy Rushing, Eddie Durum, and Count Basie (known as William Basie at that point). They would perform at Paseo Hall and the 18th and vine area. He soon took over as band leader and was credited with starting the walking bass style, instead of playing on every 2 beats he would play on all 4 beats, switching from a 2/4 to a 4/4. After the first show the Kansas City Call claimed that the Blue Devil’s where the kings of the south west. They became one of the best bands known in the south west, however only recording once on November 11th 1929 through the radio station WDAF based out of Kansas City. With all of this practice under his belt, Walter had the urge to face off against Bennie in the battle of the bands but at this point didn’t have the chance. By 1931 many of the original band members of the Blue Devil’s had already switched over to Bennie Moten’s Band, denying Walter any chance of battling. 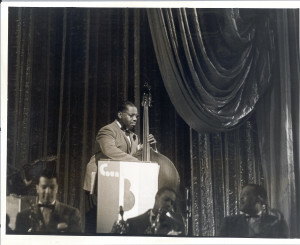 He eventually joined forces with the Moten Band on December 13th 1932. Bennie Moten died only a few years after Walter had joined; Count Basie took over and renamed the band the Count Basie Orchestra. Together they recorded such songs as 1 O’clock jump, Lester leaps in, and Jumping at the woodside. He left Basie’s band in 1946 and began to work on his own and played alongside Eddie Comdon, Ruby Braff and other members of the Basie band. He finally settled down in New York, playing with Jimmy Rushing and recording music. Walter Page preformed up until his last days, at the relatively young age of 57 he was on his way to a recording session in New York in the midst of a snowstorm. According to the obituary he contracted some kind of kidney ailment and pneumonia and was in the hospital for a week before he died in December of 1957. 1. Driggs, Frank. “About My Life In Music by Walter Page, as Told to Frank Driggs.” The Jazz Review, Nov. 1958: 12-15. Print.